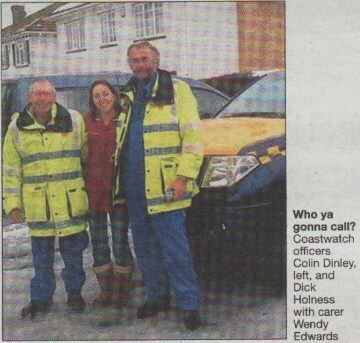 The Bay’s volunteer coastguard rescue squad went into action when snow brought the rest of the county to a standstill. The Coastguard team, who normally man Hampton’s lookout station, went into overdrive, saving the elderly and disabled as snow and ice brought Kent to a grinding halt. They fired up their four-wheel-drive Nissan Navara to ferry carers to the sick and elderly. This week they were hailed as heroes by Meridian Care coordinator Leon Collins. Although it was a very unusual assignment for us we were pleased to help. The coast is quiet anyway at this time of year although, if we had been needed on a shout, I guess the carers would have ended up coming with us! The Nissan certainly proved its worth, with some roads being virtually impassable. But the extra grip and power of the coastguard truck won through. We made contact with the team in February through social services so this time we called them direct as soon as conditions worsened. They were absolutely fabulous. Without people like them, we would not have been able to care for our clients in their own homes. Many are bed-bound. It could have been a matter of life or death. We are immensely grateful for what they did.